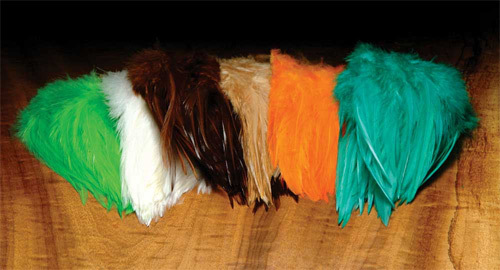 These Strung Saddle hackles are used for tails, wings, throat collars, and palmered hackles on many larger fly patterns. Saddle Hackles have a thinner center quill than Neck Hackles which allow them to wrap easier around the hook shank. They come in a wide range of colors and are stitched at the base. The saddles are 5-7 inches in length and will work with sizes 2 to 8. Try these saddles on Bugger patterns and feather-wing streamers.